Wanna secure your data in Microsoft’s cloud but lock it up by “bringing your own keys” so only you have the ability to access it? Check out our BYOK tools for Azure RMS & Azure Key Vault. These tools allow tenant administrators of the Microsoft Rights Management service to securely upload their own key (BYOK) to the service. This toolset accompanies the Microsoft Azure Key Vault service. 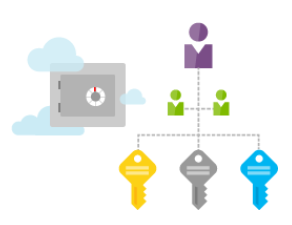 Learn more about Microsoft Azure Key Vault service. Azure subscribers can upload keys from an HSM (Hardware Security Module) that they own to HSMs in the Azure Key Vault service. This toolset is designed so that your key is always protected by HSMs, even during transport. This feature is called "bring your own key", or BYOK. The toolset on this page prepares your key for BYOK. The Azure Key Vault service is cryptographically isolated in each Azure geography (North America, Europe, Asia). You upload your keys to a specific Azure region in a specific geography. Currently in Preview – enables SQL Server encryption to use the Microsoft Azure Key Vault as an extensible key management (EKM) provider to protect its encryption keys.